© SalamPix/Abaca Press/TNS Iran's Supreme Leader Ayatollah Khamenei says Iran has defeated the U.S. in what he called its 40-year challenge against the Islamic republic and would be the ultimate loser from re-imposing sanctions on Tehran. Khamenei was speaking during a meeting with students on the eve of the anniversary of the 1979 takeover of the U.S. embassy in Tehran, Iran on Saturday, Nov. 3, 2018. "We have to brace for bad days and get rid of our incompetent managers," Biagi said. "Unfortunately, people from the poorer walks of life will suffer more than ever (because of sanctions), but we have no option but to resist and rely on ourselves." The demonstrations mark the day that Iranian students raided the U.S. Embassy and held 52 Americans hostage for 444 days in retaliation for U.S. support of the deposed monarch, Mohammed Reza Shah Pahlavi. 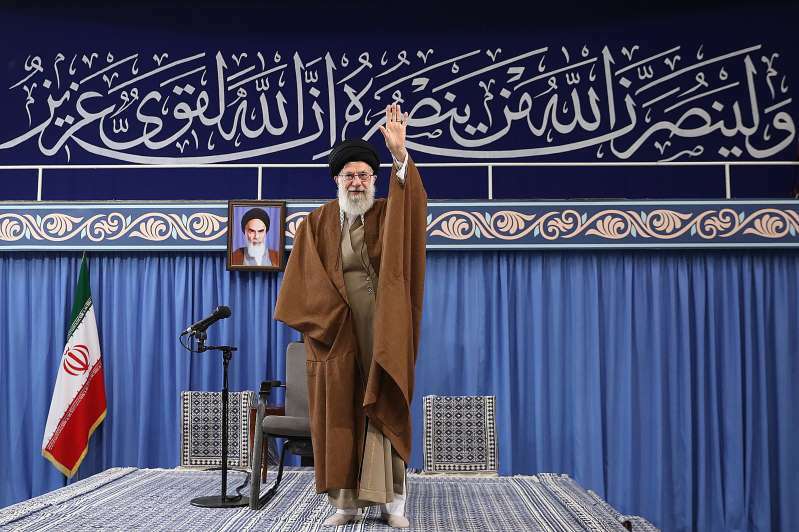 Speaking from a platform, the commander of the Revolutionary Guard, the paramilitary force close to Supreme Leader Ayatollah Ali Khamenei, said the U.S. sanctions were part of "40 years of failed plots of American administrations." "God willing, these new sanctions, which are part of the soft war against the Iranian nation, will fail too," said the commander, Lt. Gen. Mohammad Ali Jafari. Iran's leaders accuse the Trump administration of reneging on the nuclear deal even after United Nations inspectors said Tehran was complying with its obligations to curb uranium enrichment in exchange for relief from international sanctions. © Rouzbeh Fouladi/NurPhoto via Getty Images On the eve of renewed sanctions by Washington, Iranian protesters demonstate outside the former US embassy in the Iranian capital Tehran on November 4, 2018, marking the anniversary of its storming by student protesters that triggered a hostage crisis in 1979. 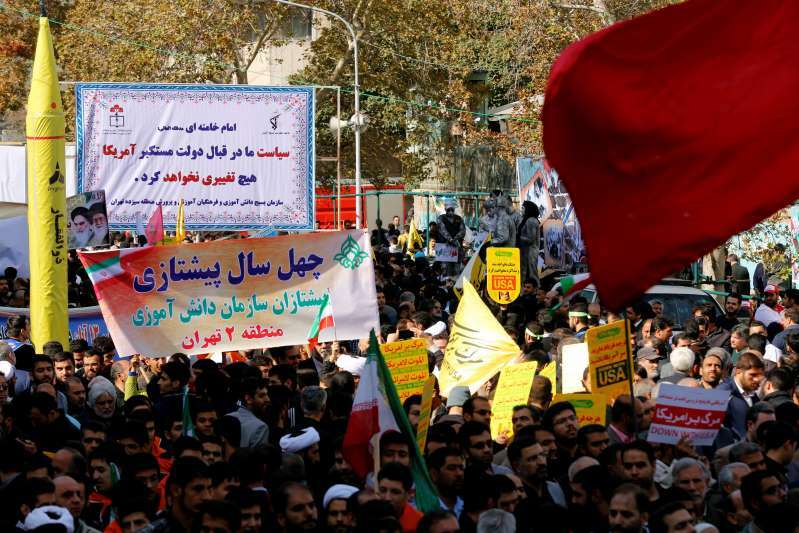 Thousands joined rallies in Tehran and other Iranian cities, carrying placards that mocked President Donald Trump, wiping their feet on fake dollar bills, and engaging in the usual ritual of burning the US flag. But it is unclear they will accomplish the administration's stated goal of driving a wedge between the Iranian people and their rulers. "We are suffering from the painful sanctions, and possibly we will suffer more ... but honestly speaking, we will tolerate and support our Islamic Revolution," said 40-year-old Masoumeh Khodaverdi. Her 7-year-old son held a flag bearing the revolution's favorite slogan: "Death to America." Watching from a sidewalk, a young man who works as a motorcycle courier refused to join the crowd and criticized Iran's establishment for failing to tackle its economic challenges. "All the speakers on the platform are jerks, and what they say is a joke," said the man, who declined to give his name because he did not want to be identified while criticizing the theocracy. "I think these sanctions will be more painful and these politicians can't do anything to reduce our pain."